Rangers produced a second half comeback to beat Queens after the Doonhamers lead twice at Ibrox. Gavin Reilly gave Queens the lead before Marius Zaliukas leveled the game. Iain Russell regained the lead but second half goals from David Templeton, Bilel Mohsni and Kenny Miller sealed the three points for Ally McCoist`s men. The last two winners of Scottish footballs third tier had clashed twice in the past two seasons with both teams boasting a victory over their opposition. Queens travelled to Ibrox sitting one place - and one point - above the Glasgow side after McIntyre`s men had an unbeaten start to the Championship. However, injuries plagued the Doonhamers in the run up to Saturday`s fixture, missing key players such as Chris Mitchell, Stephen McKenna, Paul Burns, Mark Kerr, Michael Paton and Ian McShane. It was not ideal preparation for the Queens gaffer and his side only named six substitutes as a result. Gavin Reilly returned to the fray after missing Tuesday night`s loss to Livingston and he was supported up front by Derek Lyle. A makeshift midfield comprised of Iain Russell and Dan Carmichael out wide with Kevin Dzierzawski and Lewis Kidd in the centre of the park. And the midfielders were called in to action in the opening 20 minutes as the majority of the game was played at the half way line. Both teams struggled to get a foothold in the match and the game was scrappy at times. However in the 22nd minute Queens found themselves in dream land when Gavin Reilly put the Doonhamers 1-0 up. Carmichael broke through the defence and flew down the right hand side before squaring the ball to Reilly who calmly slotted past the Rangers `keeper Steve Simonsen. 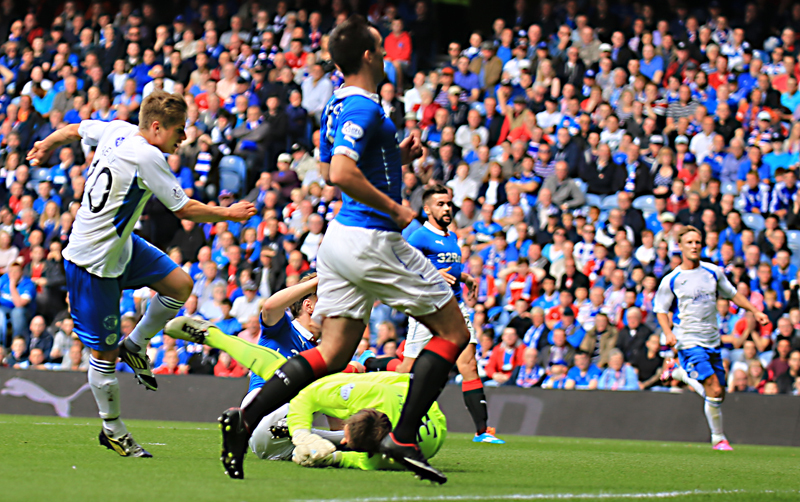 But Rangers woke from their nightmare and equalised five minutes later through a scrappy Marius Zaliukas header. Gers defender Darren McGregor forced Zander Clark in to a great save at his near post, however the ball was lofted in to the air and Zaliukas headed it home and over a crowd of players. Rangers were relentless after the goal with Kris Boyd and Nicky Clark causing problems for the centre back pairing of Higgins and Durnan. All the momentum was with Ally McCoist`s men and it seemed only one side was going to score next. However, 31,000 inside Ibrox were stunned when Iain Russell gave Queens a goal advantage for the second time in the match. Reilly turned provider this time and he played in Russell on the edge of the box and he was one on one with Simonsen. The 31-year-old showed his experience to cooly find the bottom corner and send the 1000 travelling Queens fans in to a frenzy. Referee Steven McLean blew for half time and jeers rang around Ibrox - all of Ibrox apart from the corner of Queens fan that is - and McIntyre`s men had a one goal cushion at the end of an entertaining first half. Ally McCoist made two changes at half time as he threw on Ian Black and David Templeton to try and provide some energy for the Gers. Templeton made an instant impact as he leveled the game with a stunning strike a minute and a half in to the second period. The tricky winger cut inside and fired home from the edge of the box, leaving Clark no chance. Rangers were starting to create a lot more through Templeton and he was proving to be a thorn in the side for Queens as Kevin Holt had his hands full in dealing with the 25-year-old. The Ibrox side wore down Queens and just after the hour mark they lead for the first time in the game. Bilel Mohsni had been scrutinised by the Rangers faithful all day but it was his diving header which frustratingly crept through Clark`s legs to make it 3-2. Clark was called in to action five minutes later as he spared the blushes of Dzierzawski. An awkward deflection off the American sent the ball towards the top left hand corner but Clark dived spectacularly and kept Queens in the game. Unfortunately it was game over for the Doonhamers five minutes from time as Kenny Miller scored Rangers fourth, moments after coming on as a substitute. Kris Boyd flicked the ball on with a great header and Miller chipped hapless Clark and Rangers grabbed all three points. 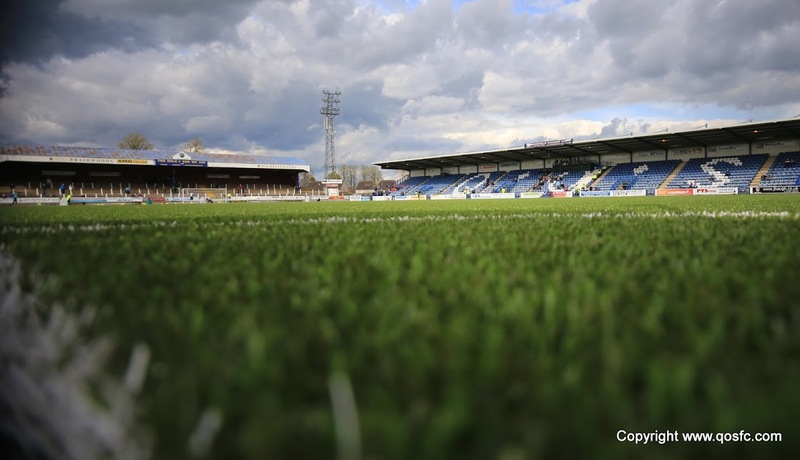 Queens now face a two week wait for their next fixture against Falkirk in the Championship. After their first loss in the league this season, the Doonhamers slump to fourth in the table but a two week break could provide some key recovery time for the ever-growing injury list. 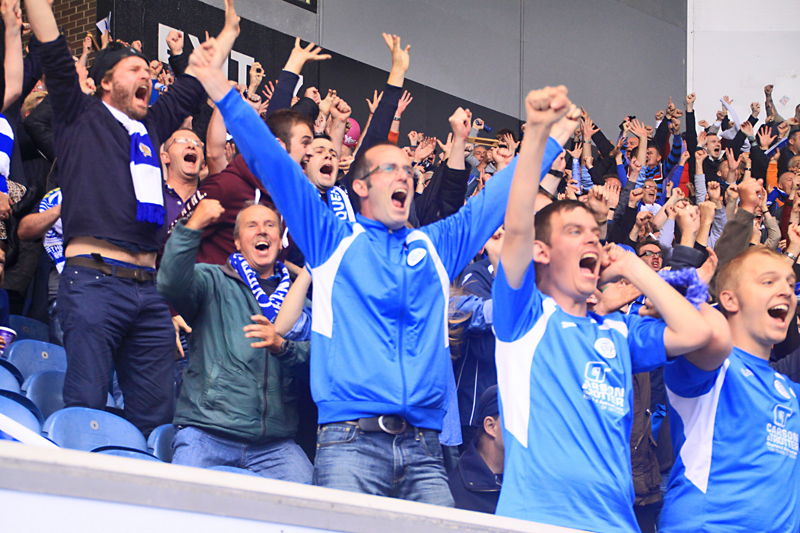 14:32 Just under half an hour until kick-off at Ibrox and the Queens fans are in fine voice already. 14:44 15 minutes to go until kick-off at Ibrox, here`s a reminder of today`s teams, starting with our opponents, Rangers. 14:49 Please note, Ian McShane is out for today`s match. Queens only have six listed subs due to injuries. 15:01 The teams are out on the park and we`re almost underway. Queens are playing in their white shirt with blue shorts and white socks. 2 min Wallace swings in a dangerous cross but the ball is dealt with and Rangers have a corner. 8 min Slow start at Ibrox as both teams are struggling to get in to the game. 8 min Kevin Holt brings down Lewis MacLeod and Rangers have a free-kick in a dangerous position. 9 min MacLeod fails to find McGregor or Mohsni at the back post and it`s out for a goal kick. 14 min Iain Russell charges up the park and looks for a one-two with Reilly but the through ball is intercepted. 16 min Russell goes through one on one with Simonsen but the flag is up for offside. 19 min There`s a stoppage in the play as the Assistant Referee Frank Connor is injured. 22 min GAVIN REILLY PUTS QUEENS 1-0 UP!! 23 min Daniel Carmichael was out on the right hand side and squared the ball across to Reilly who calmly finished past Simonsen. 1-0. 24 min Nicky Clark and Kris Boyd try and fire Rangers back on level terms but their efforts are off target. 28 min As scrappy an equaliser as you`ll see as Zaliukas heads the ball home from 10 yards out. Clark can`t reach it and the score is 1-1. 30 min Boyd forces Clark in to a great save. The momentum is with the Ibrox side now. 33 min Lee McCulloch drags his effort wide after the ball lands to him following a corner. 41 min 5 minutes to go in the first half and Queens lead 2-1. 42 min Derek Lyle comes close to making it three for the Doonhamers but his shot drags by the post. 44 min Mohsni puts Simonsen under pressure and Queens have the chance to make one last attack in the first half. Half Time Gavin Reilly and Iain Russell`s first half strikes give Queens a 2-1 advantage as we go in at the break. Half Time Queens return to the pitch in preparation of the second half. Half Time Rangers are out on the park and looks like they`ve made a change. 47 min Rangers come out firing on all cylinders and Templeton hits a stunning strike to put the home side back on level terms. 55 min MacLeod`s shot is diverted by Higgins for a Rangers corner. 58 min Nicky Law`s header goes inches by the post as Rangers try to take the lead for the first time in the match. 63 min Rangers maintain pressure as they win another corner. 64 min Rangers take the lead through a diving header from Mohsni. The last touch may have came off a Queens player. 3-2 Rangers. 67 min Derek Lyle heads over the bar but the striker appears to have taken a nasty head knock. 70 min Dean Smith replaces Derek Lyle after he goes off injured. 71 min Lewis Kidd watches his long range effort sail over the bar. 72 min Clark produces a stunning save to prevent a Dzierzawski own goal. 74 min Today`s attendance at Ibrox is 31,851. 78 min Nicky Clark has a penalty appeal turned down by the Referee. 79 min 10 minutes to go and Queens have a free kick in a dangerous position. 80 min Dzierzawski`s effort fails to test Simonsen in the Rangers goal. 84 min Law blasts wide from 12 yards out and that should`ve been the fourth for the Gers. 86 min Miller chips Clark and that seals it for Rangers. 4-2.